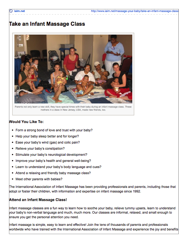 Jan is a Certified Infant Massage Instructor, trained and certified by the International Association of Infant Massage. Classes are offered through our centre; keep your eye on our newsletter to learn about the next class, taking place in the autumn of 2017. 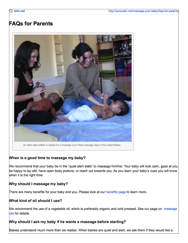 Click on the images or links below to learn more about Infant Massage. Why take a massage class?